Search Hopper by actor, genre or title – if you really want to catch that latest DiCaprio or Bond flick, say commands such as “Alexa, show me DiCaprio movies” or “Alexa, find James Bond movies” and you’ll promptly get taken to the search results page on the Hopper. This set of commands will probably save you the most time since you’ll no longer have to enter search letters/words via the remote buttons again (which can be a little cumbersome at times). Change the channel – the simplest and most straightforward command, simply use, eg, “Alexa, go to Hallmark Channel” and Alexa relays the appropriate instructions to your DISH equipment. Since the Hopper can house plenty of smart apps as well, commands such as “Alexa, open Netflix” will instantly launch those apps and save you 5-10 seconds of remote clicking each time. Pause, stop, skip, rewind and fast-forward – whether you’re viewing a recording or watching live TV, use “Alexa, pause” and similar to watch TV exactly how you want it. For those a bit leery about audio controlled playback, we tested the time delay between clicking the remote fast-forward, etc. buttons and vocalizing the command and unless your finger’s sitting right on the appropriate button, voice surprisingly tends to be a bit faster clocked from the moment the thought of rewinding, etc pops in your head. Google’s set of available voice commands for the Hopper is essentially the same. The only real difference is the waking phrase (the one that puts the device on alert). With Google’s smart devices (Home and Home mini), you’ll need to start every command with “Hey, Google” or “Ok, Google” (they’re considering custom wake phrases but for now those are the only two). As with Alexa, expect more Hopper phrases to be added soon, such as the ability to more granularly control 3rd party apps, help with general search-related questions (eg, “What’s the weather today? ), etc. Install the Alexa or Google Assistant app on your mobile phone – once open, sign in to your Amazon or Google account. Now, with the Alexa app, go to the “Settings” page, then tap “TV and Settings”. Select DISH and “Enable Skill” (this activates higher integration with DISH). With Google, go to Account » Assistant » Home Control. Tap the “+” sign and choose DISH. Pair with the Hopper – with both Alexa and Google, go to your Hopper’s “Menu”, then “Settings”. Find “Amazon Alexa” or “Google “Assistant”. Hit the “Get Code” button and enter that value into the app from step 1. Your Amazon/Google account should now connect to your Hopper. Once complete, “Confirm” and assign any/all Hopper, Joey or Wally receivers in your home. Take it for a spin with your first command to your smart assistant – if nothing happens, make sure you logged in to your account in step 1 and that your Hopper is connected to the internet. 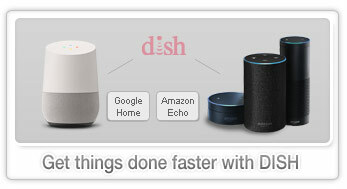 Overall, this smart assistant integration certainly isn’t a make or break feature, but as more things in our daily lives go hands-free and quicker to manage, it’s definitely a cool and time-saving feature from DISH. © Satellite-Reviews.net. All rights reserved 2009-2018, 2019.